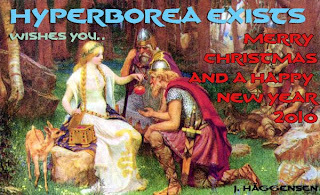 Dear friends that follow Hyperborea Exists, I have to apologice, finally I have been unable to make the updates I wanted. Things in Oslo have beem more complicated than expected and I didn’t got any free minute, in fact I had to delay my return to Madrid several days. No worries, the delay has worth the time, together with my collegues we have done a very interesting discovery that will allow me to give a further step in my most important investigation. But I wouldn’t stay without wishing you Merry Christmas and Happy New Year 2010. I know it has been a short time since we meet thanks to my blog, I hope that next year will be the building of this adventure and that you can be my partners in the discoveries I hope to make in 2010. I’m very excited thinking in whats for come, many years of efforts and patience will be awarded finally, at least that’s what I hope. I want to award you with a Christmass postcard, which illustration shows Idun and the apples, a classic illustration from Nordic mithology. Precisely, I want to go deeper with in in the next weeks. Nordic Mithology has been the inspiration for many authors, writters, musicians and so and it treasures half of legends and half of historic reality from a past far away for us. Enjoy these holyays with your loved ones and remember, one year ends and another starts, but our desire to find the truth behind Hyperborean civilizaction will remain untouchable!